I grew up in a household with a Persian mother. Amongst the other Persians I knew I wasn't Persian enough. Amongst the Americans I knew I wasn't American enough. I was always somewhere in the middle. It was a bit of a struggle growing up, never knowing exactly where I stood. 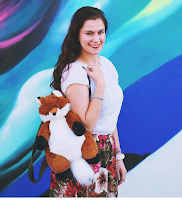 As an adult I've come to love that I'm a bit different, & with that in mind, I had to create my own traditions. As of right now my little family consists of just me & Fred. We love preparing meals together to bond & unwind at the end of each day. It's our version of a homestyle tradition, at least for now. To me, homestyle means you get food made with care, love, & thought. We always try to mix flavor with heartiness — something that tastes delicious but has some nutritional value. 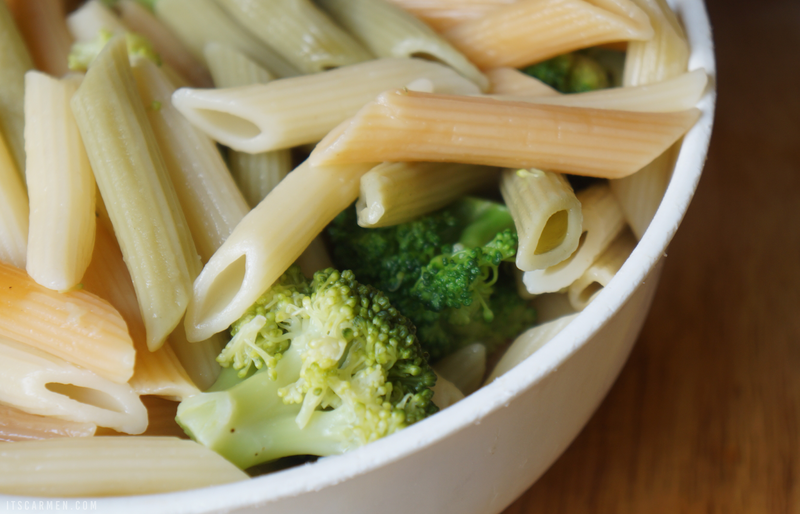 This Penne Pasta with Veggies is an easy vegetarian dinner recipe that you can serve at your next family dinner or if you're like me, you'll just eat the leftovers for days to come. You'll get 4 to 6 generous portions with a healthy vegetable to pasta ratio. Let's get started! 1. Bring water to a boil & cook your pasta according to the directions on the packaging. 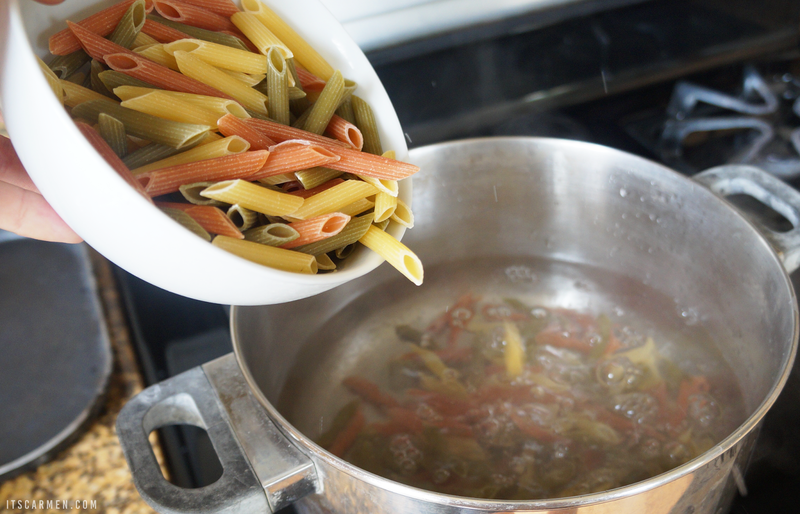 I chose a tricolor penne pasta because I love the color, but you can use anything your heart desires. 2. 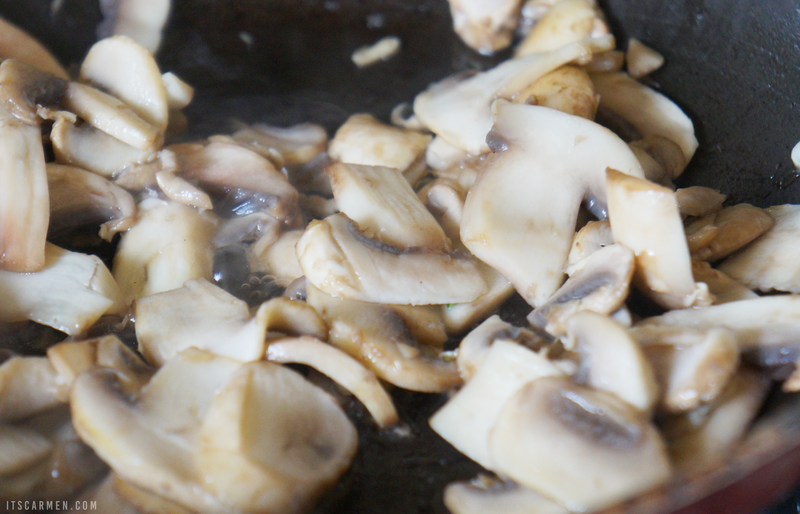 Chop your mushrooms while your pasta is cooking. Sautée them for 5 to 7 minutes, or until they half in size & all the water evaporates. 3. Your pasta should be almost al dente by now. Toss in your chopped broccoli to let it blanche & cook inside the water. This is my favorite way to save myself from washing another a dish. 4. 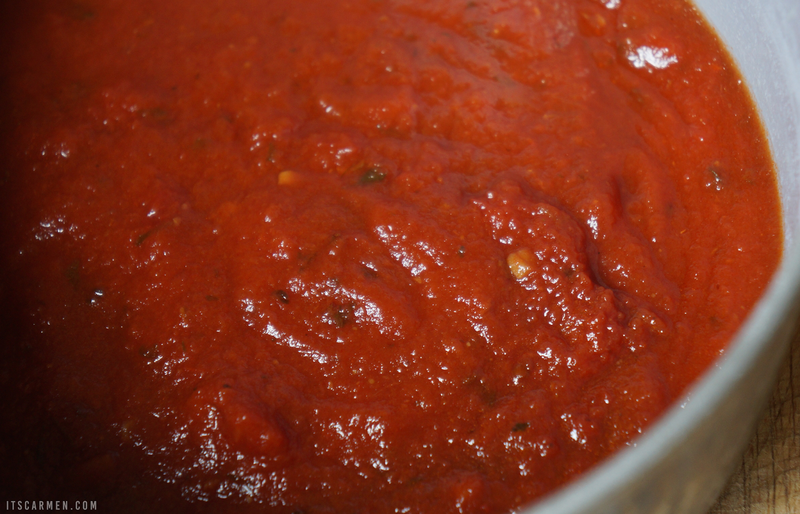 Add your Ragu Homestyle Sauce to a sauce pan & cook according to directions. Strain your pasta concoction. 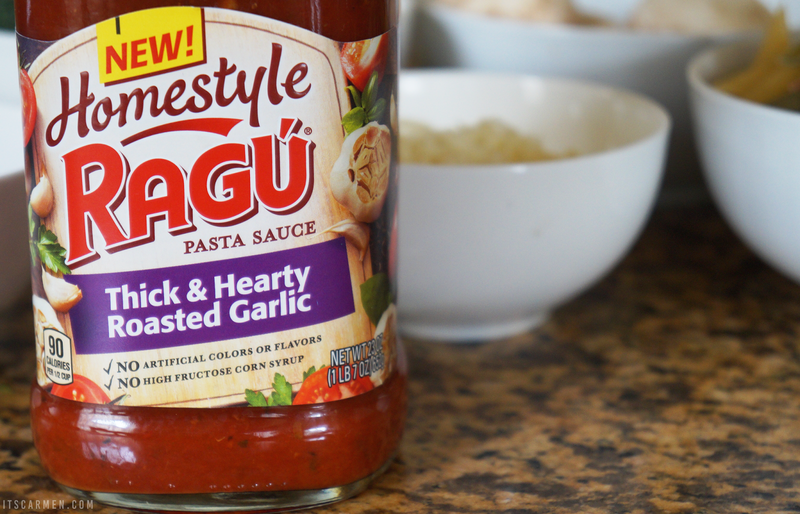 Add it to your plate then give yourself a generous heap of Ragu Homestyle Sauce. 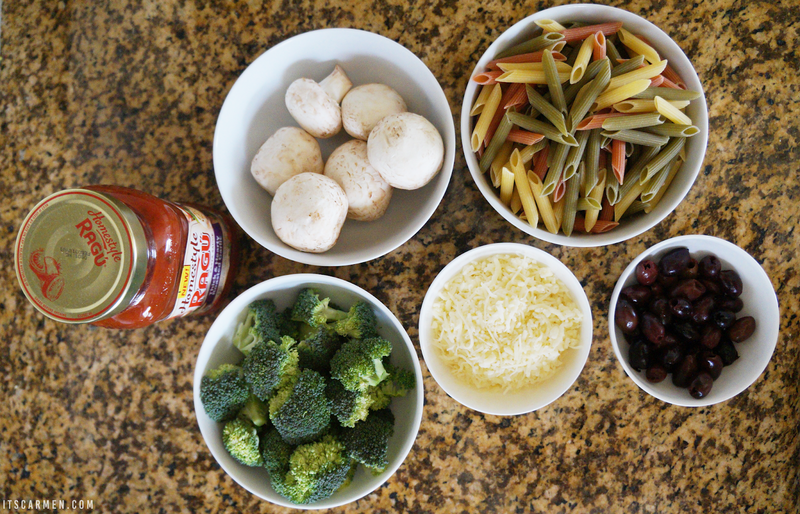 Drop on some mushrooms & then top with a sprinkle of cheese & chopped olives. I didn't add any additional seasoning or spices because the Thick & Hearty Roasted Garlic Sauce has such a rich garlic flavor. The olives & cheese give you just enough salt. With everything combined, you're good to go. There you have it! 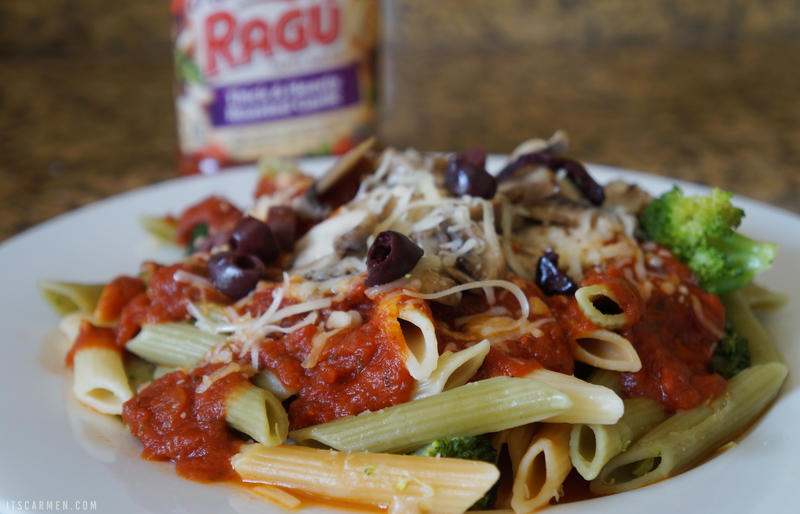 I know it's been a while since my last recipe, so I'm glad to have partnered with Ragu in order to entice myself to do so. Bonus points because Fred & I both have enough lunch to last for a couple days. Great idea with the mushrooms and broccoli. I'll definitely have to try this recipe. Looks really affordable too. I just found it on Target.com for $1.99--way better than the $4 I paid at my natural food store for a comparable brand recently! I never think to add broccoli to my pasta! Such a good way to add some veggies. Ohh, I am loving this! It's so easy and looks absolutely delicious! 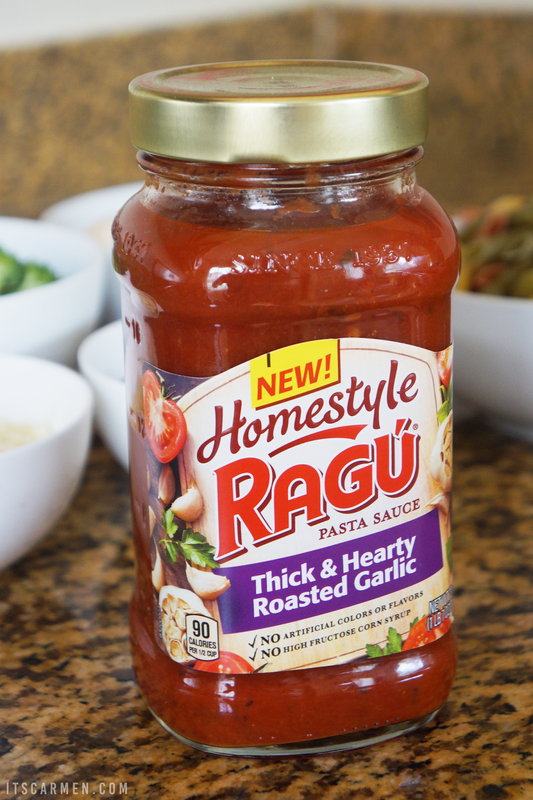 Must say I have never tried Ragu though, I make my own but many of my friends love the brand. Looks delicious & a great way to get in a heap of veggies into a hearty dinner! Thanks for sharing. yum! I used to make a similar version of this when i was at uni :D love it! Pasta is probably one of my favourite foods, this looks so delicious! I think a lot of people who have parents from a different culture feel that way at some point in their lives, at least I have. Awh I feel too akin to not being enough in terms of being apart of a culture. I love that you found your groove though that's what's most important. Thanks for sharing your poignant perspective. This looks so flavorful! 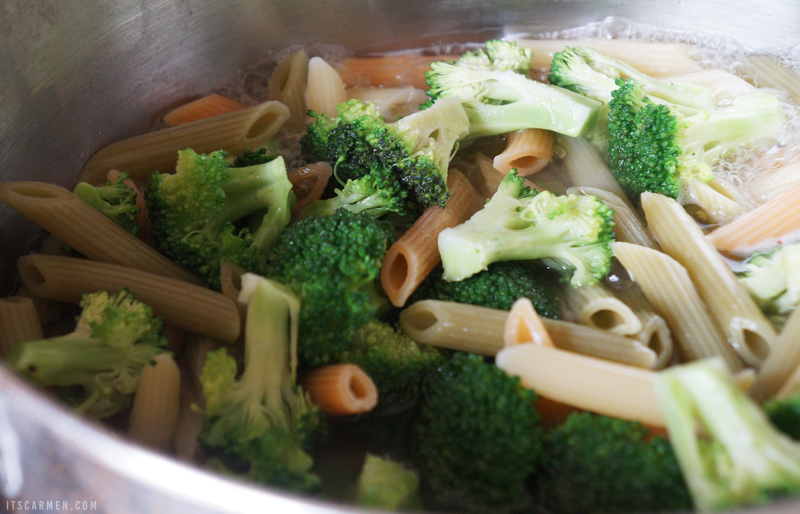 I love mixing veggies with pasta!